Many small businesses can successfully ramp up customer engagement and sales by getting involved with established marketing events that occur year after year. Small Business Saturday is one such event. Here is a look at what this day is all about and how your small business can benefit from celebrating Small Business Saturday. Small Business Saturday is one day every year set aside to a support small businesses across the entire United States. The event was started by American Express in 2010 and is celebrated on the Saturday after Thanksgiving. Nestled in between Black Friday and Cyber Monday, this event encourages consumers to get out and shop at their local neighborhood stores. In 2016, an estimated 112 million shoppers participated in the seventh annual Small Business Saturday by shopping at local shops, setting a new record for the event. The goal of Small Business Saturday is to remind consumers that they play a key role in helping the small businesses in their community thrive, and encourage them to get out and shop and dine at local businesses. Founding partner American Express keeps the trend continuing after Small Business Saturday and all year long with the Shop Small campaign — a nationwide movement to celebrate small businesses every day. If you have a local brick-and-mortar store or restaurant, then the power of this event is significant for you. Small Business Saturday is a great time to refocus your marketing efforts on your local community. Start by updating your marketing plan to use local SEO marketing tactics, social media, and public relations to put the spotlight on your business in the community. Shop Small Poster: Print out this poster, fill in your business name and what customers love about your business. Then display the poster in your shop to show your participation in the Shop Small campaign. Event Flyer: Use this flyer to help you get the message out about special events you are hosting at your store and inspire customers to Shop Small with you. Email Template: This template is an excellent guide for reminder emails to your customers, letting them know they can Shop Small at your business. Customize your message by adding an image or logo and links to your social profiles. Facebook Cover Photo: Upload this image to your Facebook page to remind your followers to stop by your business. Social Media Images and Post Templates: Help drive traffic to your business by posting Shop Small graphics and customized posts on your social media platforms like Facebook, Instagram, and Twitter. Make sure you take time to get your store ready to accommodate increased foot traffic on Small Business Saturday. Get your Shop Small signage up and ready, and consider offering some special in-store shopper perks like coffee, snacks, and coupons during the day. If you are successful at creating a customer-friendly environment, you will get more customers through the door, and hopefully more sales. One of the best features of Small Business Saturday is the boost it gives to the idea of community. You can leverage the event to start ongoing collaborations with fellow business owners. 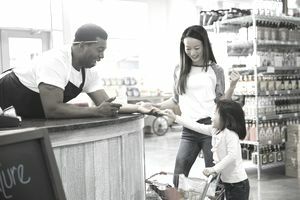 Explore partnerships that help both of your businesses reach a broader audience, get more foot traffic in your stores, and increase purchases in both locations. It could be as simple as distributing coupons or flyers for other businesses in your store, or it could be a year-long marketing partnership that involves co-hosted events and special promotions. You can also use Small Business Saturday to get to know your customers a little bit better. Start using surveys leading up to Small Business Saturday to ask for your customers' input on your products and services, your in-store shopping experience, your customer service practices and more. Make sure you listen closely to the feedback you receive and try to incorporate the insight of your customers into your business in ways that lead to even more customer satisfaction. Customers love having the opportunity to weigh in and have a voice with the small businesses they love, especially if it means they get to contribute to the future success of the business by sharing their thoughts and ideas. You can still leverage Small Business Saturday even if your business doesn't have a local store or shop. Many of the ideas above can be applied to an online business with just a few tweaks. You can, for example, team up with other online businesses to double your reach. And you can certainly use the digital tools provided in the Shop Small kit to get the word out on your website and in social media. If you have an e-commerce store, you have an excellent opportunity to leverage Small Business Saturday and Shop Small. Try kicking off a promotional campaign on Small Business Saturday that offers discounts, specials or VIP memberships for a limited time. Promote the campaign by using social media to engage with your current and potential customers. In addition to these Small Business Saturday and Shop Small resources, the American Express OPEN Forum is an online resource created specifically for small business owners. The site provides articles, videos, insights and tips, and a place to connect with other entrepreneurs to help grow your business. You can search the site for tips on leveraging Small Business Saturday and other marketing events. Remember, not only can you create your own marketing campaigns around Small Business Saturday, but you can make Shop Small a part of your marketing strategy all year long. Mystery Shoppers Are Out There -- You Can Become One Too!